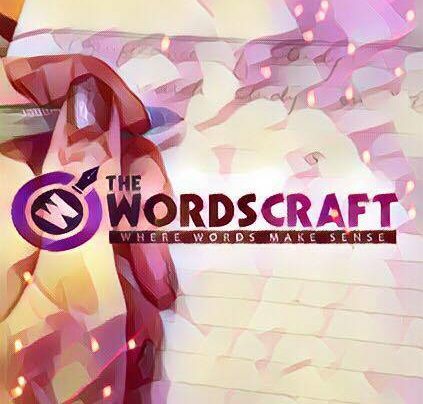 Author Aisha IqbalPosted on February 16, 2017 Categories Happiness & Personal ManagementTags Aisha Iqbal, Colours, Happiness And Personal Management, The Words Craft, TWC1 Comment on WHAT YOUR FAVOURITE COLOUR REFLECTS ABOUT YOUR PERSONALITY?! 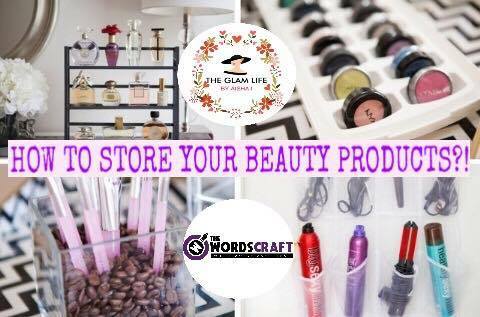 HOW TO STORE YOUR BEAUTY PRODUCTS? 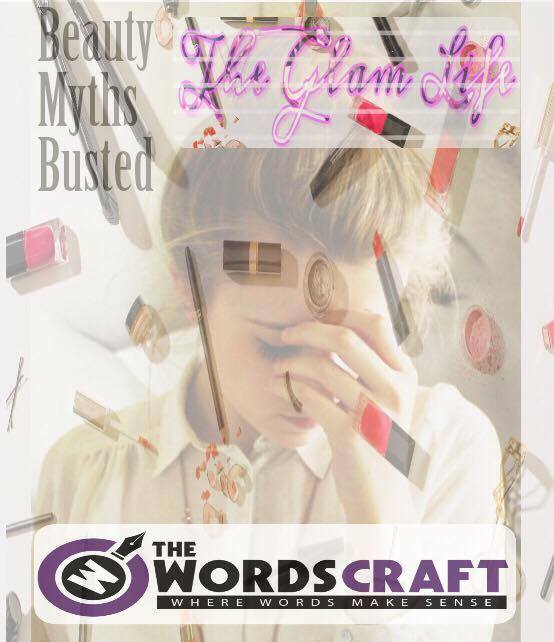 Just like all other products, beauty products also have a life. There is a shelf life & period after opening which means life of the product, once the lid of the product is opened for use. Usually products do not expire after PAO because the way you handle your makeup in general can extend its shelf life. If you take care of your products, they can last more than expiry date being safe to use. Other than this, there are several different environmental conditions & things that can destroy your product like heat, sunlight & oxidation. Specially when you use beauty products that contain skin care ingredients in them be destroyed before time, if not stored properly. Heat & Sunlight can change the texture of the product. In extreme cases it can cause bacteria to grow inside. This phenomena is commonly observed in Wonder Wax (Cold Wax). It gets watery & less tacky if kept in heat. Also, it gets too thick & less sticky if kept in very cold weather. Oxidation is the phenomena where chemical change takes place in a product due to coming in contact with air. Oxidation can change the chemical formula of the product, resulting colour & fragrance change of the product. In extreme cases the product can even dry out & become tacky. It is important to close the lid of the products well after use. 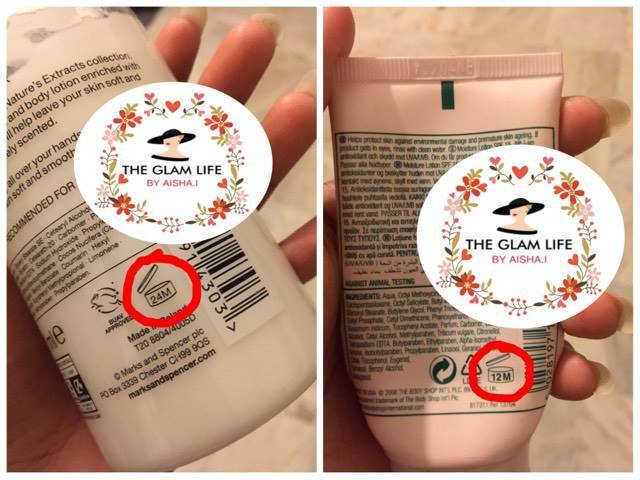 Author Aisha IqbalPosted on February 12, 2017 Categories The Glam LifeTags Beauty Products Storage, TGL, The Glam Life By Aisha Iqbal, The Words Craft, TWCLeave a comment on HOW TO STORE YOUR BEAUTY PRODUCTS? Lying there gasping for breath, she gave me a thumbs up. She fought but then the fight became too much to ask of any human being. She bore the burden of this infliction with grace & dancing at her cousin’s wedding she did not look cancer-stricken. I hope you are not lonely. I hope you have met Abu. And I hope you are together happily forgetting the pains you have both endured. I wish you could know how the entire world took your story so personally & wept for you. 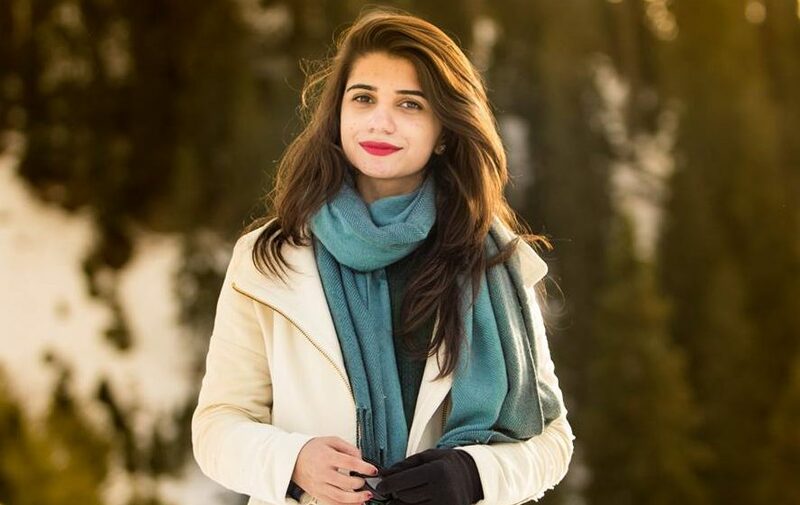 Mahnoor, wherever you are, I hope you’re happy and peaceful. P.S. Don’t forget to say prayers for Mahnoor, Sammar & their family along with every patient & their loved ones who have undergone the terrible trials of Cancer. May their soul rest in peace. Aameeen! Also, pray for the SHIFA of all other patients who are suffering from any sort of disease & fighting for their life. May Allah bless them with a healthy, happy & long life. Aameeen! 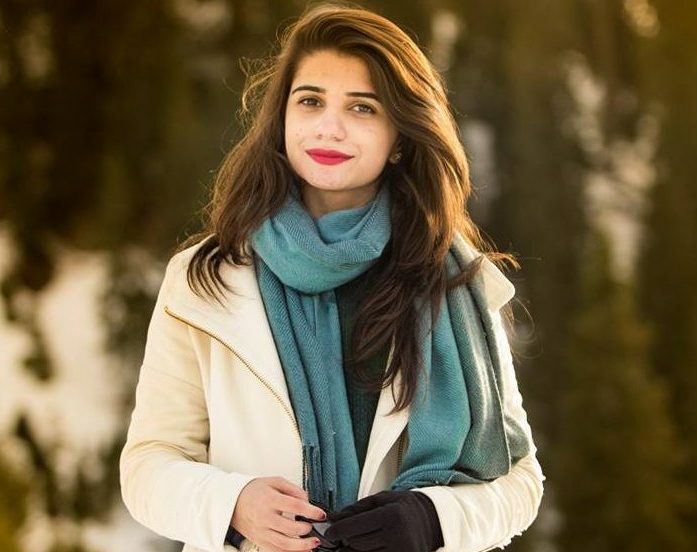 Mahnoor Shabir is a Pakistani girl who took her early education from Beaconhouse School Systen & was currently studying in Lahore University of Management Sciences (LUMS). 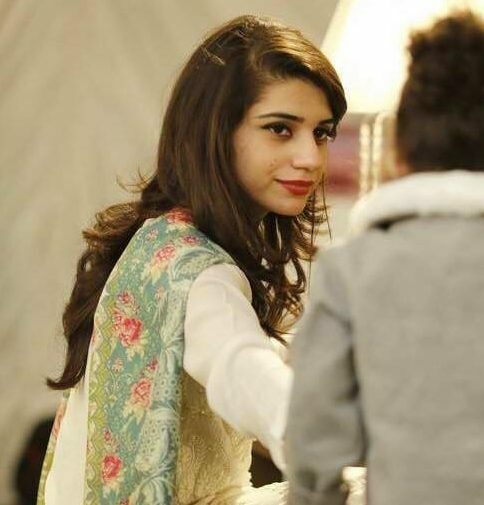 She was 21 years old, fighting a deadly disease known as cancer like a brave warrior. She was diagnosed cancer few years back & won the battle against it. But this battle was not over yet. She was recently diagnosed cancer, once again. 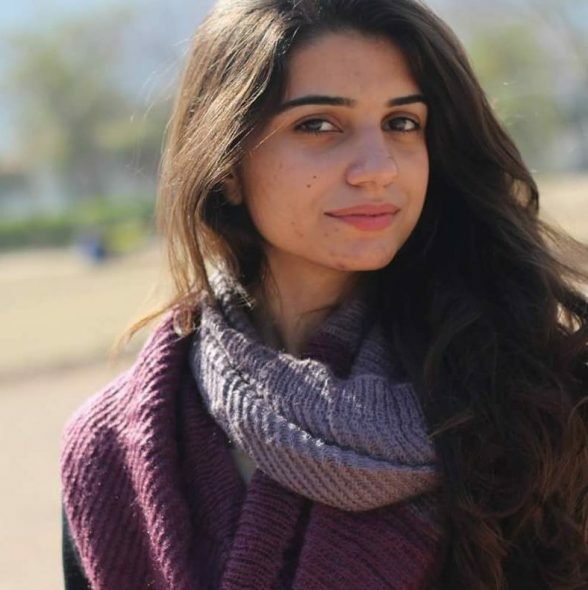 Knowing about her disease, Mahnoor recently updated her facebook status on 18th January 2017, 7:31 p.m. saying; “Won a battle but the war against cancer isn’t over yet. Fortunately or unfortunately, it relapsed just a few days back. I am a 21 years who should be worrying about my quizzes and if I made it above the average, but instead I have to worry about my blood counts being in the normal range. I am 21 years old who should be worrying about my GPA, but instead I worry about the result of my biopsies. I am a 21 years old who should be searching for the best post grad universities abroad, instead I am searching for the best cancer clinics abroad. I am a 21 years old who should be rejoining her university again this week, instead I am getting hospitalized again. I am a 21 years old who should be worrying about a chipped nail, instead I worry about the effects of chemotherapy. I am a 21 years old who should be worrying about relationships, instead I worry about emotional attachment with almost anyone. I am a 21 years old who should be the one making trips to the hospital for her parents and wheeling them around, instead they are the ones doing it. But none of that upsets me, it makes me only more grateful that I am an extra ordinary 21 years old. I am a 21 years with incredible strength, willpower, resilience and courage to face one of the most deadliest maladies again. A second attempt may be frustrating but I believe it can be easy too. And it makes me grateful to have the most amazing and supportive parents out there. But I am a 21 years old who is nothing without Allah or the prayers that He answers. So I would request you all to keep me in your prayers as much as you can. No one knows when one of it might get accepted! ?” And then she updated this on 28th January 2017, 2:00 a.m. “Please! Please! I beg you to all to keep remembering me in your prayers. And more than that, I need you to you to pray for my parents!” A few days back she passed away. All her status reflect her love & desire for living life like a normal person. Her photos reflect the vivaciousness she bared in her heart. So many people among us who are blessed with a good health are so ungrateful to this blessing because we do not realize its value.. We should be thankful to Allah (S.W.T) for every little blessing we have. We go to school, college, university or job everyday. We go out with friends, party, enjoy life. We live our life the way we want. We have no idea about the patients who are admitted in the hospital. They spend their every minute looking at the ceiling or walls, thinking about their recovery. Parents wish that their children will take care of them & will be their support system when they will grow old. We have no idea how heartbreaking it is when parents sit in the hospital for hours, days, weeks or even months in hospital, waiting for their sick children to get well. It is even more heart wrenching when parents give birth to their children, bring them up & then bury their children in graves. 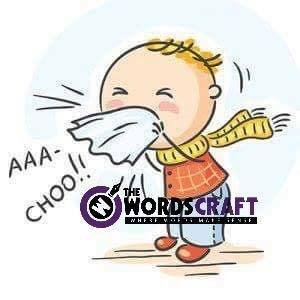 May Allah (S.W.T) bless all the sick people with healthy & long life! May Allah (S.W.T) grant Mahnoor the highest rank in Jannah. May Allah (S.W.T) bless her parents, family & friends with infinite patience! Hats off to all the cancer patients, who are fighting this deadly disease. Just know you are not alone. Somewhere, someone is fighting for his/her survival & life. She gazed towards me with enrage in her eyes & said, “Don’t you call me Queen next time!” I was puzzled & dazzled by her reaction. Girls at her age normally love such titles. She dusted herself & stood up refusing to take my hand. I had a crippling in my heart & was confused on her response to my help. I interjected, “Sweetheart, have I offended you? Are you off because you fell & I wasn’t there to reach out to you?”. She took my hand, kissed it & said, “Never, I can never be offended by such a silly thing, I’m offended because you called me Queen.” First, I sighed & then I laughed. I asked, “Why? Is being called Queen a matter of shame? Or is there something wrong with the word? Normally girls love to be called Queen, especially at your age.” She started walking on the pedestrian path, with her ice cream in her mouth & replied with a spark in her eyes, “Do you know what is the real function of Queen?” I paused & stopped walking, I knew what she was saying, I knew what she meant. She narrowed her eyes & insisted upon her question, this time stressing the words the real function of Queens. I replied, “Yes, I know, I have also watched Queen Bee movie, I know their real function is just to lay eggs.” Something pinched me in the heart, a girl so young of age 15 has revealed a secret upon me, FUNCTION OF QUEEN! WOMEN! QUEEN! “So, now you won’t call me Queen next time, okay?”, she said & I agreed. Since that day I never called her Queen, but that question left me in a dilemma, so many days, so many years, since eras, women are calling themselves Queens without knowing the real function of Queen. Queens are to lay eggs, just lay eggs?? Just to marry & prepare a generation? Really?. She left me in a great tyranny. I couldn’t stand the exclamatory meaning of Queen, I didn’t know why she hated it, Queens are treated like a lady of code. They are treated highly, queen bees, they are treated like a majesty, is it a matter of shame? No! How can such a wonderful act become a matter of shame? Then what makes a Queen? Is it just to lay eggs? No! It is to take responsibility of an entire nation & delivering it with ultimate sense as a Queen Bee does. To be Queen is a responsibility by nature no one can escape. I thought, “To hate the word at her age was okay, I didn’t mind it. She must have given the similar response as she did, she must concentrate on becoming the Woman of Value.” I was still thinking when my phone rang, it was her on call, I received the phone, it was so much noise on the other side, she shouted in excitement, “You know, you know… I got scholarship, I’m so happy, I’m coming home to you, you’re my Queen, I’m just coming, I’m on my way.” And she hung up. My heart went warm & tears rolled over my cheeks, she just called me Queen, she knew what she meant, I’m successful to raise her, she knew what a Queen means & whom it suits. I was happy & relieved she knows the importance of things. I was very happy. Beauty Blog or Beauty Channel? Let us know in your comments below what do you guys want to see. Either video tips & tutorials or written reviews. 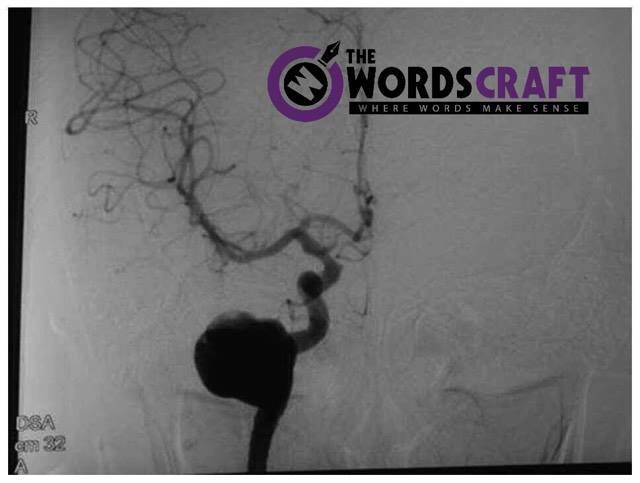 As promised in our previous post “Reason For Being Away” here is our post about Cerebral Aneurysm. It is said 1 in 50 people have a brain aneurysm. The annual rate of rupture is approximately 8 per 100,000 people or about 30,000 people in the United States suffer a ruptured brain aneurysm. There is a brain aneurysm rupturing every 18 minutes. Ruptured brain aneurysms are fatal in about 40% of cases. Of those who survive, about 66% will suffer some permanent deﬁcit. There are almost 500,000 deaths worldwide due to ruptured brain aneurysms & half of the victims are younger than the age of 50. So here we begin with the understanding of hypertension & cerebral aneurysms. The pressure of the blood against the inner walls of the blood vessels, varying in different parts of the body during different phases of contraction of the heart & under different conditions of health, exertion, etc. 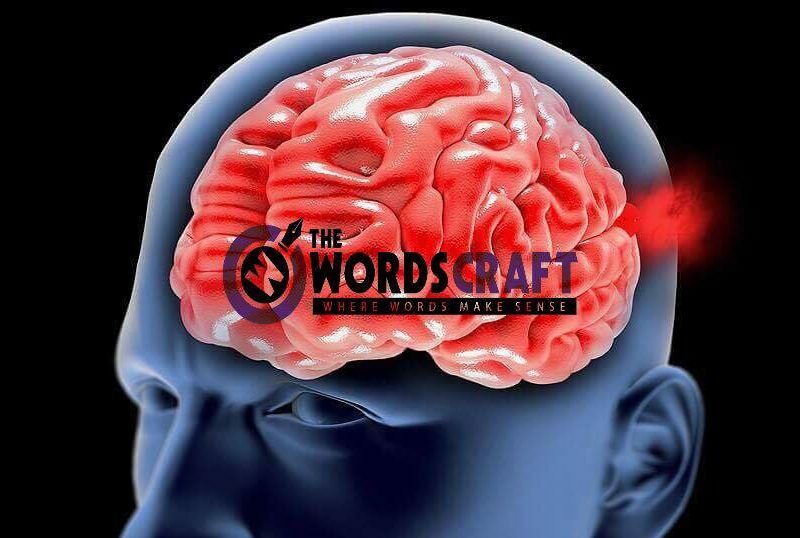 Cerebral or brain aneurysm is a cerebra-vascular disorder in which weakness in the wall of a cerebral artery or vein causes a localized dilation or ballooning of the blood vessel. Hypertension is known to be a silent killer (by killing the person silently without any symptoms). Its silence can be very dangerous sometimes which can be fatal or can leave a serious morbidity behind. Hypertension may cause many health problems but this is article is written with the idea to provide you information about cerebral aneurysm. The blood vessels are made up of three layers .i.e. tunica intima, media & adventitia. When the Tunica Intima the inner most layer gets damaged usually due to high blood pressure or due to trauma, the vessel’s elasticity is compromised & the blood gets turbulence leading to the ballooning of vessel known as False Aneurysm formation. 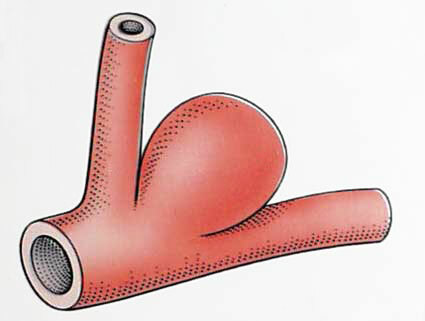 The True Aneurysm is said when all three layers of vessel is involved. These Aneurysm can occur anywhere is the human body such as Abdominal Aorta or other blood vessels. If this aneurysm occurs with in the cranial cavity in the cerebral vessels it is known to be Cerebral Aneurysm. Aneurysm is a weak bulging spot on the wall of a brain artery very much like a thin balloon or weak spot on an inner tube. Over time, the blood flow within the artery pounds against the thinned portion of the wall & aneurysms form silently from wear & tear on the arteries. As the artery wall becomes gradually thinner from the dilation, the blood flow causes the weakened wall to swell outward. This pressure may cause the aneurysm to rupture & allow blood to escape into the space around the brain, which may be Fatal or can be a serious Complication. 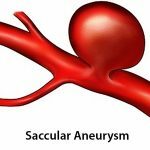 SACCULAR ANEURYSM: It is a round shaped aneurysm that accounts for the vast majority of intracranial aneurysms. They are also the most common cause of non-traumatic subarachnoid haemorrhage. 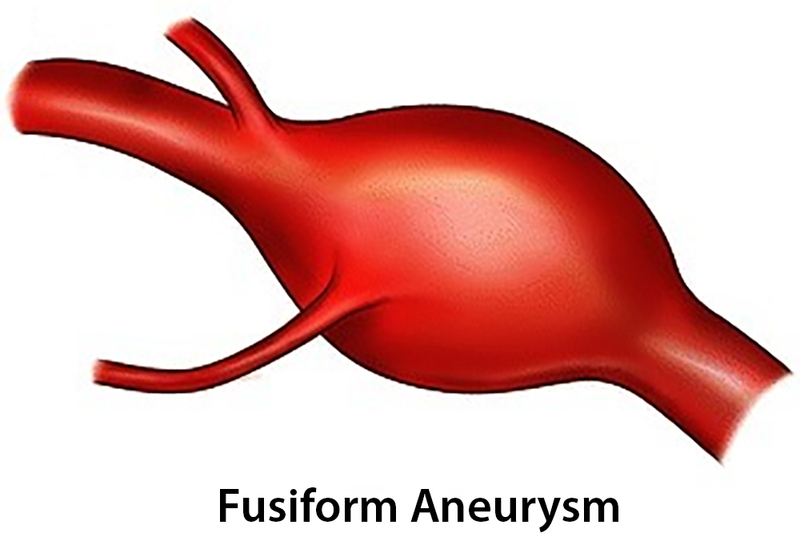 FUSIFORM ANEURYSM: Also known as Spindle Shaped Aneurysm. It is a variable in both diameter & length; their diameters can extend up to 20 cms. 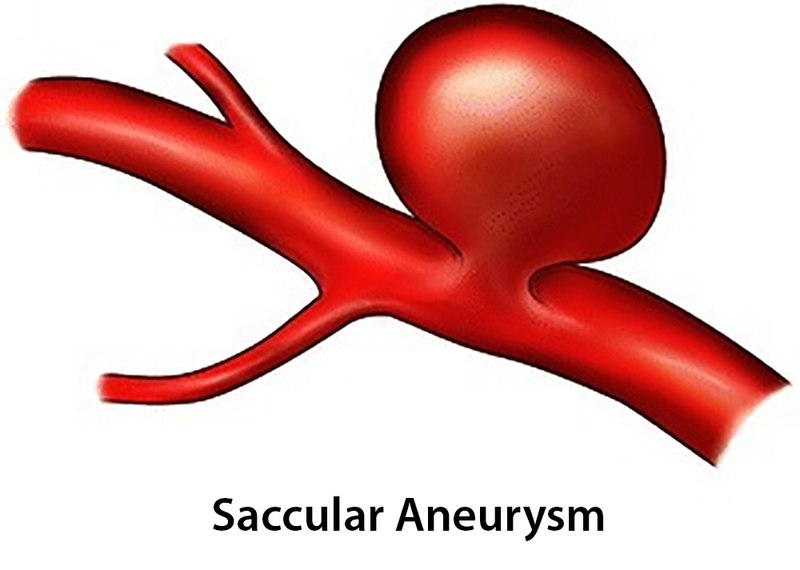 BERRY ANEURYSM: It is a small aneurysm that looks like a berry & classically occurs at the point at which a cerebral artery departs from the circular artery (the circle of Willis) at the base of the brain. 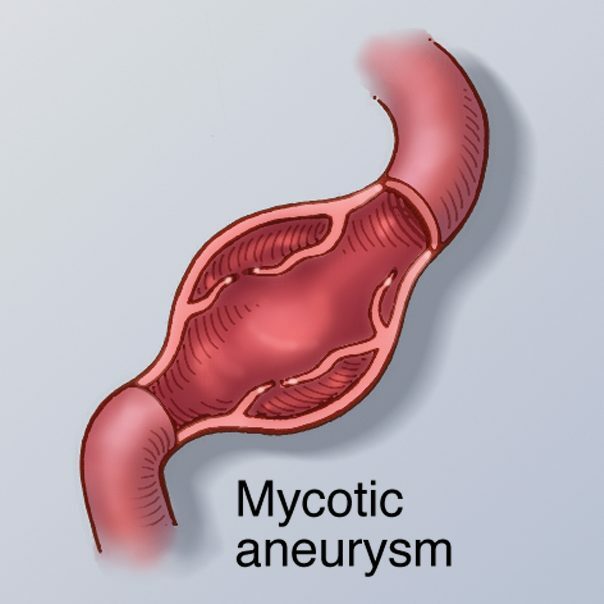 MYCOTIC ANEURYSM: It is a localized, irreversible, atrial dilation due to destruction of the vessel wall due to infection. Diagnosis is usually based on two things; a positive history with a positive series of events & radiological images. MAGNETIC RESONANCE IMAGING (MRI): MRI uses a magnetic field & radio waves to create detailed images of the brain, either 2-D slices or 3-D images. A type of MRI that assesses the arteries in detail (MRI angiography) may detect the site of a ruptured aneurysm. COMPUTERIZED TOMOGRAPHY (CT): A CT scan, a specialized X-ray exam, is usually the first test used to determine if you have bleeding in the brain. The test produces images that are 2-D “slices” of the brain. With this test, you may also receive an injection of a dye that makes it easier to observe blood flow in the brain and may indicate the site of a ruptured aneurysm. This variation of the test is called CT angiography. CEREBROSPINAL FLUID TEST: If you have had a subarachnoid hemorrhage, there will most likely be red blood cells in the fluid surrounding your brain and spine (cerebrospinal fluid). Your doctor will order a test of the cerebrospinal fluid if you have symptoms of a ruptured aneurysm but a CT scan has not shown evidence of bleeding. The procedure to draw cerebrospinal fluid from your back with a needle is called a Lumbar Puncture or Spinal Tap. CEREBRAL ANGIOGRAM: During this procedure, your doctor inserts a thin, flexible tube (catheter) into a large artery — usually in your groin — & threads it past your heart to the arteries in your brain. A special dye injected into the catheter travels to arteries throughout your brain. X-RAY IMAGES: They can then reveal details about the conditions of your arteries and the site of a ruptured aneurysm. This test is more invasive than others and is usually used when other diagnostic tests don’t provide enough information. Treatment of depends upon the condition, size & location of aneurysm. MEDICAL THERAPY: Small, unruptured aneurysms that are not creating any symptoms may not need treatment unless they grow, trigger symptoms or rupture. It is very important to have annual checkups to monitor blood pressure, cholesterol & other medical conditions. Small, unruptured aneurysms require regular imaging examinations to make sure that they have not grown or changed significantly. NEUROSURGERY: Depending upon the person’s risk factors, open surgery may be recommended. Patients are placed under general anesthesia, an opening is made in the skull, the brain tissue is spread apart & the aneurysm is surgically exposed. Then the neurosurgeon places a surgical clip around its base. The clip seals off the aneurysm in a way that blood can not enter. For an uncomplicated surgical clipping procedure, the hospital stay is usually 4-6 days. Full recovery usually takes several weeks to months. NEUROINTERVENTIONS / NEURORADIOLOGY: Depending on the aneurysm’s size, location & shape, it may be treatable from inside the blood vessel. This minimally invasive procedure is similar to the cerebral angiogram. However, in addition to taking pictures, a catheter is directed through the blood vessels into the aneurysm itself. Then, using X-ray guidance, the endovascular surgeon carefully places soft platinum micro-coils into the aneurysm and detaches them. 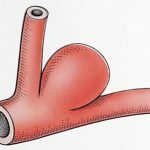 The coils stay within the aneurysm and act as a mechanical barrier to blood flow, thus sealing it off. For an uncomplicated procedure, the hospital stay is usually 1-2 days. Recovery after the operation usually takes 5-7 days. For a complicated surgery or endovascular treatment, or if an aneurysm has bled into the brain, hospitalization may last from 1-4 weeks, depending on the patient’s medical condition & any complications caused by the hemorrhage. 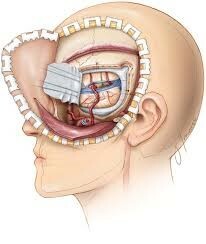 SURGICAL CLIPPING: It is a procedure to close off an aneurysm. The neurosurgeon removes a section of your skull to access the aneurysm & locates the blood vessel that feeds the aneurysm. Then he/she places a tiny metal clip on the neck of the aneurysm to stop blood flow towards it. ENDOVASCULAR COILING: It is a less invasive procedure than surgical clipping. The surgeon inserts a hollow plastic tube (catheter) into an artery, usually in your groin & threads it through your body to the aneurysm. 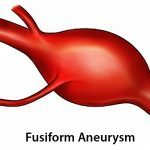 WHAT IF I AM AFRAID OR NEUROSURGERY & CARRY ON WITH MY ANEURYSM? Living with an aneurysm is like living with a tiny time bomb constantly ticking in your head. The worst thing is not knowing that you have a aneurysm. RE-BLEEDING: It occurs in nearly 19% of SAH patients. SAH patients who experience re-bleeding at any time, approximately 70% will die. Re-bleeding is most likely to occur within the first 2 weeks of the SAH. Peak times within this time frame are within the first 24-48 hours & between 7-10 days. VASOSPASM: It is the narrowing of a cerebral blood vessel due to irritation. Vasospasm results in reduced cerebral perfusion, cerebral ischemia, potential infarction & deterioration of neurological function. The mortality rate from vasospasm is between 40-50%. Brain damage can occur as a result of the fluid buildup. This can lead to developmental, physical & intellectual impairments. It requires treatment to prevent serious complications. HYPONATREMIA: Subarachnoid hemorrhage from a ruptured brain aneurysm can disrupt the balance of sodium in the blood supply. This may occur from damage to the hypothalamus, an area near the base of the brain. A drop in blood sodium levels (hyponatremia) can lead to swelling of brain cells & permanent damage.